A driver struck and killed Terrence Montrose, 26, as he was walking along Rockaway Point Boulevard in Breezy Point, Queens, just after midnight on Sunday. The 22-year-old driver, whose name has not been released by police, remained at the scene, and no charges were filed. NYPD says an investigation is ongoing. According to NYPD, Montrose, who lived in East New York, was walking “in the eastbound travel lane” just east of Beach 193rd Street by Fort Tilden when the driver struck him from behind. The driver’s 2005 Toyota Sienna had a smashed windshield and dented front end from the force of the collision, the Daily News reported. NYPD did not provide any information on the driver’s speed at the time of the crash. The crash occurred in the 100th Precinct and in the City Council district represented by Eric Ulrich. If you would like to express concerns to the NYPD about pedestrian and traffic safety in the neighborhood, the 100th Precinct’s community council meets this Wednesday at 7:30 p.m. in the Knights of Columbus Hall, 333 Beach 90th Street. I think that sad, narrow, crumbled strip of barely-visible concrete in that ditch on the right-hand-side is meant to be the sidewalk. Or maybe just some cynical urban planner making fun of the idea of sidewalks? Not quite clear to me. There’s a sidewalk on the westbound side only. Based on the daily news photo, it looks like the driver hit the guy on his front driver side, which means either the guy was right in the travel lane (as reported), or that the guy was walking in the bike lane and driver drifted pretty far into it to hit the guy. I’m looking at the picture and don’t see a sidewalk on either side. If you follow the google maps link in the original post, you can see it better (try satellite view too). It looks a bit overgrown in the street view (circa 2012), I haven’t been there this year yet personally, but last year I biked in that area a few times and it was in decent shape+wasn’t overgrown. Buffered bike lanes like this ought to, at minimum, come with flexi bollards by default. We all know that paint alone is a band-aid, not a cure, for the epidemic of death by motor vehicle in this city. Something that could have been bought with that extra $50 million. I worked with Terrence. He was an excellent worker, and he loved life. This is an awful loss for everyone who knew him. He should be cracking jokes and saving hard earned money for decades to come. He is going to missed by many good people. My deepest condolences to his family. If you’re somehow privy to information that hasn’t been widely reported yet, any idea how fast the motorist might have been going? The speed limit here is 25 mph, and the 100th Precinct issued less than one speeding ticket per day in June, so I have a hunch that he or she might possibly have been driving somewhat in excess of the 25 mph speed limit, contributing to the outcome. I bike that road at least every other day and jog it occassionally, the sidewalk is a shambles, that said it is passable but not pleasant and on Saturday was overgrown with weeds. Most pedestrians and joggers walk/jog on the edge of the bike lane especially given the presence of ticks in the area. In this particular case the pedestrian apparently chose the least safe option which was to walk down the median at night on a dimly lit road, even still that would have been survivable had he not stepped out suddenly into traffic. The mile of road the accident occurred on adjacent to Fort Tilden is a city road that bi-sects a Federal Park – it is very difficult to get any accountability from the government to put in proper sidewalks and maintain them. Michael, can you get a hold of me through this blog? What was he doing walking out there at midnight? You might as well ask what was the driver who hit him doing driving out there at midnight. I personally like to go for rides or walks at 2 or 3 AM. I don’t need to have reasons for it. Are you homeless by any chance? Or just crazy? Who are you asking this of? Joe R or the guy who was out for a drive at midnight? Are you retarded? Its pretty normal to drive at night. Its not normal to be walking in the middle of nowhere by yourself at midnight. Unless you are some kind of moron, homeless and/or on crack. Neither. It’s nice and peaceful to be out that time of night, especially on a bike. You don’t have to deal with all the car-related stupidity which exists from about 6 AM through maybe 10 PM. He could have been coming home on public transit and perhaps just missed a connecting bus. When you miss a connection that time of night, the next one is often in 30 or 45 minutes. It’s usually faster just to walk rather than wait for the next bus. I’ve done it myself when I just miss the bus which takes me home from the subway. It’s faster to walk 2.5 miles than to wait 30 minutes for the next bus. There’s no bus stop anywhere near there, and why would there be. It’s in the middle of nowhere. If he was on the sidewalk to the right of the grass and bushes far from the road there’s no way the car could have hit him unless it was on purpose. If he is dumb enough to walk on the road at night instead of using the sidewalk that’s no one’s fault but his. He was more likely to be high on crack or suicidal. He wasn’t suicidal and didn’t do crack. Doesn’t matter if he was in the street or on the sidewalk the driver must have not been paying attention because he would’ve never got hit no matter what. If it’s a 25 mph speed limit he wouldn’t have been killed at that speed. Your ignorance fits you though. To make such a statement as if you know what you’re talking about. Watch how you speak about people because you do t know who’s watching and you never know, you might be next. The road is for automobile traffic, the sidewalk is for walking. Not sure why some seem to have such difficulty grasping that simple concept. Maybe the driver was drunk, maybe he was texting, or maybe he or she was playing Pokemon go, or maybe the victim was playing Pokemon go. Either way walking on the road is a great way to get yourself run over by a car. You’re still going to be dead regardless whose fault it was. Playing chicken with a van is not a good idea. Do people really need that explained to them? I learned it from my mom when I was five. It’s true. When the first roads were established during the dawn of civilization, the city elders declared they were for cars. And it was so forevermore. Abram? He drove out of Ur! The roads are for whatever the government chooses to use them for. The government could decide tomorrow it’s in society’s best interest to allocate road space for chickens instead of cars and drivers will have no legal recourse. There’s no usable sidewalk on the street in the picture, so where exactly is someone supposed to walk? Its called walking in the grass. He could have walked in the wide area of grass to the right of the road or used the sidewalk which can’t be seen in this photo because of the angle but as others have said several times it is definitely there. Sidewalks are made for a reason. The road in the photo is not a pedestrian street, but if you still want to walk on it no one can stop you. Have fun playing dodge ball with the speeding cars. Thanks for the tip, Officer. “|Rockaway Point, Queens – In response to complaints from local residents over a badly-deteriorated stretch of sidewalk along Rockaway Point Boulevard running from Fort Tilden, along Gateway Park, to Breezy Point, U.S. Senator Charles Schumer and state Assemblyman Phil Goldfeder (D – Rockaway Point) are calling on the National Park Service to make repairs to the sidewalk in order to increase pedestrian safety along the major roadway and improve public access to nearby national parkland. Their request comes in light of an accident last month in which a pedestrian was struck and killed along the boulevard. “Mr. Montrose’s tragic death is a wake-up call that – from beginning to end – the Rockaway Boulevard sidewalk needs to be repaired by the National Park Service. This route is the gateway to Gateway, Breezy Point, Roxbury and Fort Tilden and the safety of the many walkers, bikers, joggers and visitors who use it will be greatly enhanced by much-needed repairs and upgrades. The bottom line is that safety should always be a top priority and that’s why Assemblyman Goldfeder and I are strongly urging the National Parks Service to make these much-needed repairs and improve the conditions along this pedestrian route,” said U.S. Senator Charles Schumer. In a letter to National Parks of New York Harbor Commissioner Joshua Laird, Schumer and Goldfeder called on the local office of the National Park Service to make repairs to the sidewalk that runs on the south side of Rockaway Point Boulevard, between the Marine Parkway Bridge and Beach 201st Street. The legislators contend that the condition of the sidewalk creates a safety hazard and limits public access to the Ft. Tilden section of the Gateway National Recreation Area. Goldfeder and Schumer also emphasize the boulevard’s role as a major evacuation route during disasters such as Superstorm Sandy, as well as a vital route for walkers, bikers, birders, nature lovers and visitors to the area’s unique park and beaches. Goldfeder and Schumer’s letter comes just weeks after a fatal accident along the boulevard. On the evening of July 24th, 26-year-old Terrence Montrose from East New York was struck and killed while walking in the eastbound lane of Rockaway Point Boulevard, adjacent to the damaged sidewalk. According to reports, the 22-year old-driver, who was not identified, remained at the scene and was not charged. Community leaders have informed the legislators that numerous requests to repair the sidewalk were made to the National Park Service and other agencies in recent years. However, questions surrounding the ownership of the sidewalks have complicated these efforts. In 2014, Goldfeder’s office secured an agreement from the city Department of Transportation to allow a young Breezy Point Boy Scout to make minor improvements to the sidewalk as part of an Eagle Scout project. In a copy of the agreement provided to the Assemblyman’s office, the DOT emphasized that by agreeing to the scout’s project, the agency did not assume any ownership or jurisdiction over the land. In their letter, the legislators urged NPS to work with the city DOT and other agencies in completing the repairs. “The city and the federal government need to resolve this bureaucratic red tape and make these repairs before any more pedestrians get hurt,” concluded Goldfeder and Schumer. 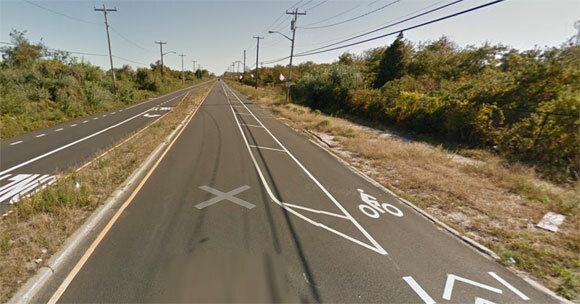 We are writing in regards to the condition of sidewalks along Rockaway Point Boulevard on the Rockaway Peninsula, specifically as it relates to access to public land and safety and emergency evacuation routes, in light of the recent traffic fatality involving pedestrians on the roadway. The sidewalks running along the south side of Rockaway Point Boulevard between Beach 169th and Beach 201st Streets are in a considerable state of disrepair, with large sections broken or missing and tall weeds and grass growing in many places. This limits public access and has created multiple safety and trip hazards for visitors to the Fort Tilden areas of Gateway National Recreation Area that walk along the Boulevard, and negatively impacts the overall character of the surrounding community. We understand that numerous attempts have been made in recent years to engage the National Parks Service on this issue and request repairs to NPS-owned sections of the sidewalk. However, it is our understanding that no repairs have been made to date, with the exception of minor improvements completed as part of the Eagle project for a young Breezy Point Boy Scout. As you know, Rockaway Point Boulevard is the sole roadway connecting Fort Tilden and Breezy Point to the rest of Rockaway and the city, and has served as a major evacuation route during Superstorm Sandy and other emergencies. Likewise, the sidewalk running along this vital thoroughfare is the primary pedestrian route for thousands of families that come to enjoy Gateway and the various public recreational opportunities in our community. By making these long-overdue repairs, we can ensure the safety of pedestrians and motorists alike and provide a more enjoyable experience for all. We respectfully request that you direct the appropriate personnel to investigate this situation and, in collaboration with the appropriate city agencies, repair the sidewalk along Rockaway Point Boulevard. Please inform us of any actions taken. If you have any questions regarding this request, please do not hesitate to contact us directly. Yesterday, just outside Jacob Riis Beach, these cars treated the stop signs like Yield signs, and totally ignore the families of people trying to cross the street here. A cyclist was injured (crushed his bike) because these motorists can’t seem to understand what a red octagon means. Firstly, Breezy Point and Roxbury are private property. In case anyone cared, this fellow was trespassing on private property before he sought to run away from a private security force to wit he ran into an oncoming vehicle on a private road. Message: Stay out of private property! Yes, the death penalty is a perfectly appropriate response to trespassing. You and George Zimmerman should start a support group for people who feel threatened by young men who use their feet to get around. The street where Montrose was killed is not a “private road.” Nice try, though. If a police officer stood there and handed out tickets to cars (and cyclists) failing to stop and for cyclist riding on the sidewalk ( as pictured here) and failing to dismount on the Marine Parkway Bridge (as likely what you just witnessed) they would have a very busy day. Stay out of private property or die? You sound like the joker. Terrence was a New Yorker, and he had no intention to ever harm anyone. He worked all the time. He just went to the beach on a day off and got lost walking back to the train after dark. His best friends aren’t blaming the driver. Shame on you. You’re talking about a good person’s life being lost too soon. It’s a real tragedy, not a message. NYC motorists killed four people riding bikes over a 15-day period in June and July. In every case, NYPD said the victim ran a red while citing no corroborative evidence.